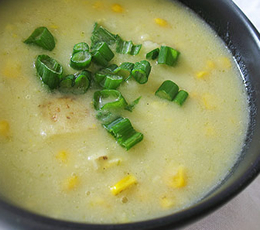 Try this innovative but easy soup recipe to get you through those cool, damp days of spring. Thanks to our Featured Foodie, Lisa’s Kitchen! Heat the olive oil in a large saucepan over medium heat. When hot, add the onion and the white parts of the scallions, and sauté for 2 – 3 minutes or until the onion is soft. Add the celery and stir for another minute. Toss in the potatoes and pour in the water or vegetable stock. Raise the heat slightly and bring to a slow boil. Reduce the heat to medium-low, cover the pan, and cook until the potatoes are just tender, about 30 minutes depending on the size of your potato cubes. Stir in the corn and continue to simmer for 10 minutes. Stir in the milk or cream and green curry paste, and simmer for 2 – 3 more minutes. Remove from heat and purée a portion of the soup with a hand blender or in a countertop blender. Season with salt and serve hot or warm, garnished with the green parts of the scallions.